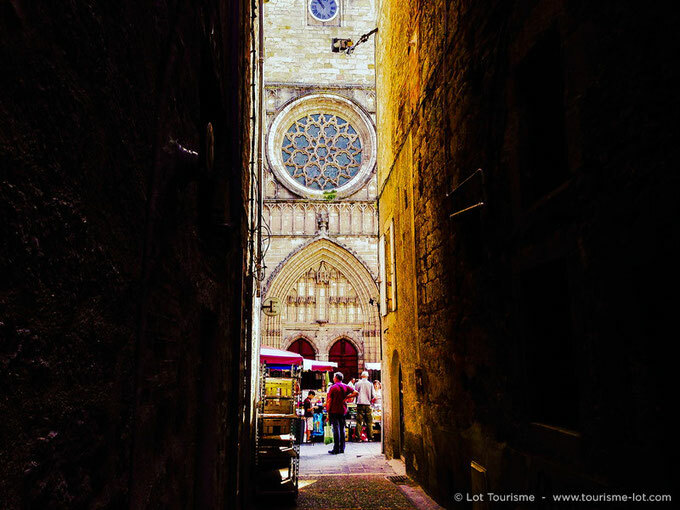 Cahors market - the best in France? It's a serious business, the French local market! So much so, that the French are about to start voting for the Plus Beau Marché de France. There's no better place to get a snapshot view of the local produce and day-to-day life of a French town than at its weekly market. After a first round of votes, Cahors market has made it through as the candidate from the Midi-Pyrénées region*. Cahors market sits around the base of Saint-Etienne Cathedral in much the same way has it has done for hundreds of years. What would have once been a daily market, where the local farmers would make the daily journey from the surrounding countryside to sell their produce to the townsfolk, it now takes place every Wednesday and Saturday morning of the year. The market square, with the buildings that ring it and the small winding streets that lead off it, is little changed since medieval times, and sets the perfect scene for todays local producers to follow in the footsteps of their predecessors. 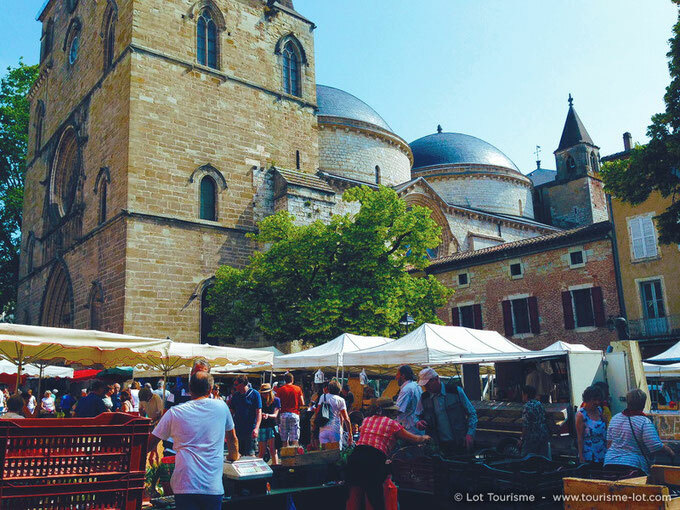 A favourite of UK celebrity chef, Jamie Olivier, Cahors market is principally a local produce market. Here you will find Rocamadour goats cheese, Périgord walnuts, foie gras and Cahors wine amongst the fruit and vegetable stalls. There is also a famous local apple cake called Pastis, which is not to be missed! According to the season you might happen upon truffles, cèpe (porcini) mushrooms, or the excellent strawberries that also thrive in this area. 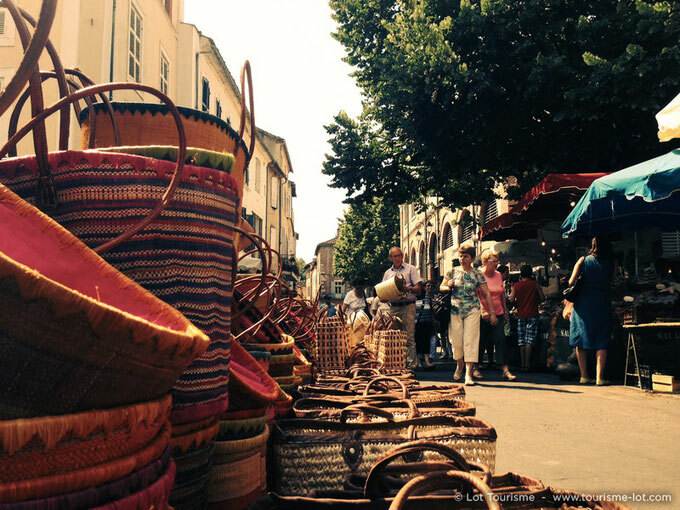 Among the non-food stalls are the basket sellers, where you can pick up your woven panier de marché, an essential accessory for all self-respecting French market goers, to stash the mornings purchases! Cahors market is a great place to soak up the local atmosphere, flâner (dawdle) and listen to the local accent as the market traders ply their wares. After your basket is filled, take the time to sit at one of the cafés or restaurants, for a glass of wine or a coffee and to taper la causette (chinwag) with the locals, known as the Cadurciens. From Gourdon, Cahors is either a 40 minute drive or a 25 minute train journey. There is plenty to see and do in the town and we will soon be putting together another blog to tell you about the rest, but in the meantime you can get a taster in our article on the iconic sites near Gourdon. We'll also keep you posted on how Cahors market does in the battle for the title of France's best market! *The old region of the Midi-Pyrénées has fused with Languedoc-Rouissillon to form the new region of Occitanie, but it seems that for the purposes of this competition, the old battle-lines have been re-drawn! This year's winner is Sanary-sur-Mer, near Toulon, in the South. We are still delighted that Cahors market won the Midi-Pyrénées round. Well done Cahors!